"Uncharted Territory" brings together local talents like author Sharma Shields and conductor Eckart Preu. It's become a common conundrum for classic arts organizations — how do you receive, and more important, retain support from the younger, technology-saturated generations? An innovative collaboration on Friday night seeks to explore that question and change perceptions in both the old and new schools of arts patrons. 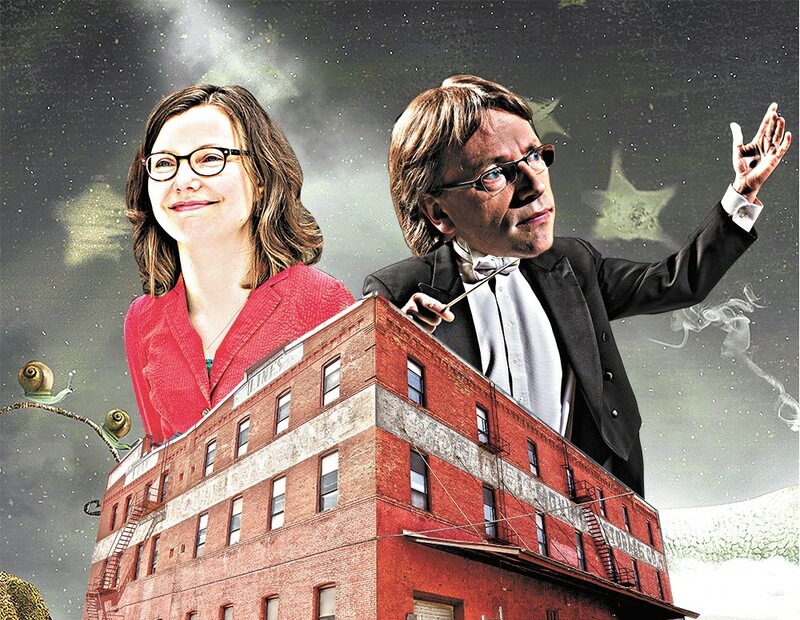 By teaming up, the Spokane Symphony and arts nonprofit Terrain are looking to bring together their respective supporters for a one-night fundraiser performance — "Spokane Symphony + Terrain: Uncharted Territory" — the first of its kind. While event organizers aren't revealing many details of the show in order to maintain an element of mystery, the intent is to unite the Symphony with several local musicians who the orchestra may not perform with in a more traditional setting. Participating musical groups include hip-hop orchestra the Flying Spiders, indie-electronic pop duo Water Monster and songstress Hannah Reader. Rounding out the performer lineup is writer Sharma Shields and Gonzaga theater professor Charlie Pepiton. "Usually our music and bands in town, we have a totally separate existence," says Spokane Symphony music director Eckart Preu. He likens the collaborative effort to Parisian arts salons; constructive, social gatherings of creatives across disciplines dating back to the Renaissance. "We're doing something similar here, enriching each other and the audiences. It's a different kind of performance, not like a concert [but] more unpredictable, and you have different art forms playing off each other. As an artist, that is what you live for," Preu adds. The core of the performance focuses on George Frideric Handel's Water Music suites, 21 short movements ranging from 30 seconds to four minutes in length. During the event's first planning meeting months ago, Preu was struck with an epiphany to perform Handel's work. "I thought, Water Monster — Water Music," he recalls. "That is the perfect music; it's old-ish, from the height of Baroque movement, and people still love it." Preu explains that Water Music was composed at the request of King George I to be played during a 1717 boat party on the River Thames that lasted hours. "It's party music from way back," he adds, laughing. In another break from the Symphony's norm, Uncharted Territory is being staged inside the historic Washington Cracker Co. building downtown, currently being renovated to house a permanent gallery space for Terrain and other tenants. Days before the show, construction is temporarily being halted so the performance can occur. Organizers of Terrain — the showcase of emerging artists, musicians, poets and performers held on an October Friday for the past seven years — have proposed collaborations with the Spokane Symphony several times before. This time, though, it was the orchestra which approached them, says Terrain co-founder Ginger Ewing. "They are really innovative in terms of their programming and thinking outside of the box to bridge the gap between traditional happenings and reaching a broader audience," she says. Intentional collaborations like this between artistic groups across disciplines have been gaining traction locally in recent years.